Promotional products are useful or unique items that can be imprinted with a company logo and designed to keep the business’s message in front of their customers and prospects for extended periods of time. Impact Marketing offers the largest, most innovative and cost effective promotional product selection available today. Check out our Online Store or Call us Today! Impact Marketing will help you make your promotional product purchase and investment, not an expense. 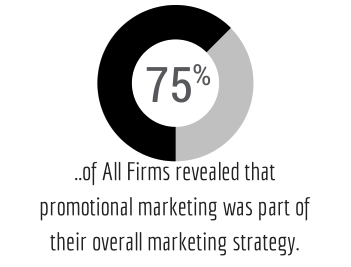 Over 2/3 of All Firms revealed that promotional marketing was part of their overall marketing strategy. Before you start your next promotional marketing campaign for your small business, take the time to carefully plan the incentives and objectives. Do you plan to collect names as leads or discount an item as a loss leader to gain a larger customer base? Determine the reason for the promotion. Who is the target of your promotional campaign? Is it your competitor’s customers or existing clients who have not made a purchase in the last 12 months? How will your business decide if promotional marketing is a success? Select a clear goal and let us help you measure the results. Call us Today! Setup your next promotional marketing campaign for your business and experience a sales boost! Click on any of the above solutions to learn more about what our team can provide to you. Copyright © 2010-2019 Impact Marketing Company. All rights reserved.